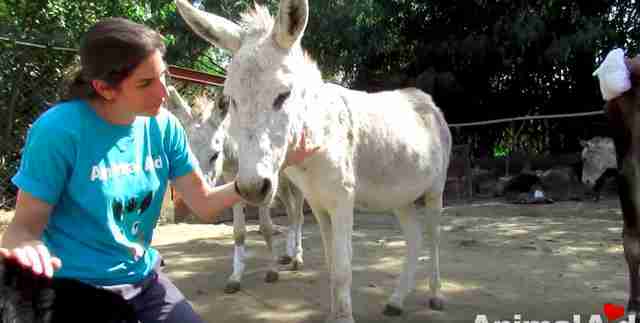 His spirit broken when they found him — but now he loves being hugged and petted. 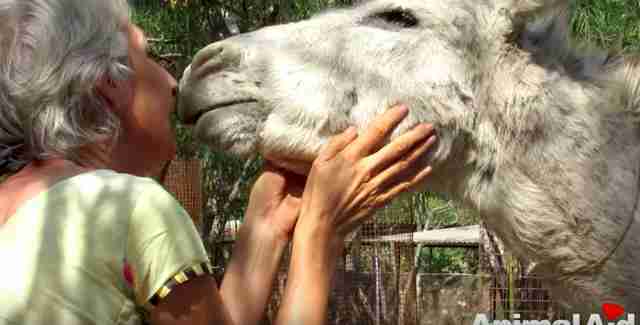 Rescuers at Animal Aid Unlimited were horrified when they received a call about a donkey in need. Someone had brutally beaten him with a pipe, and then left him alone to suffer. 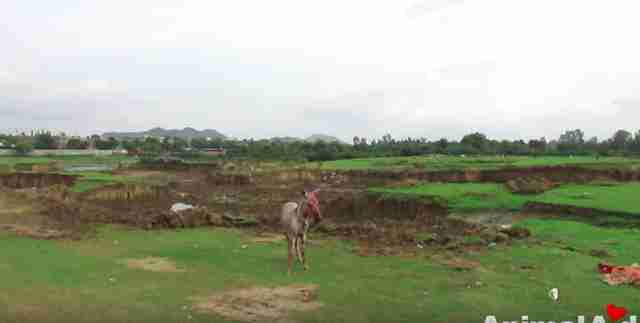 They immediately rushed out to where the donkey had been seen — and were shocked and heartbroken by the state they found him in. 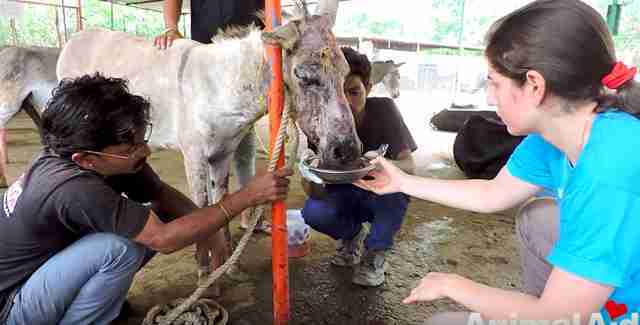 The poor donkey, later named Veeru (which means brave in Hindi), was standing alone in a field, bruised and bleeding. He had been hit all over his body, but his face and head suffered the most, and he was clearly in so much pain. 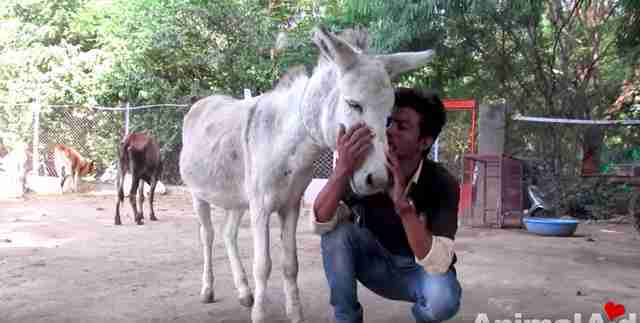 Veeru seemed defeated and terrified as rescuers approached him, and they knew the poor donkey had a long way to go before he would be able to trust people again. “We had never seen cruelty like this before,” Animal Aid Unlimited wrote in a video about Veeru’s rescue. … and get him into their truck to take him to get treatment for his wounds. Though he was scared, he seemed to know he had no other options, because if he stayed in that field on his own, he probably wouldn’t make it. Once Veeru was safely in the care of Animal Aid Unlimited, his rescuers were able to stop the bleeding and treat more than 20 deep wounds on his body using antibiotics and painkillers. Helping to ease his pain was the first step in getting Veeru to trust people again, but everyone who worked with him knew that it wasn’t going to be that easy. … until finally, Veeru realized he was safe and no one was going to hurt him anymore, and he finally became willing to let himself be loved. Veeru is a huge sweetheart now, and absolutely loves getting pet and cuddled by his new friends at Animal Aid Unlimited. They’ve decided to keep him forever and be his permanent family, and Veeru is clearly so grateful to them for taking him in and saving his life. Veeru’s rescuers reported what happened to the police, according to the video, who were able to track down the abuser and arrest him. He is currently awaiting trial. Thanks to Animal Aid Unlimited and its refusal to give up, Veeru is able to love and trust again, and is thriving in his new forever home. To help other animals like Veeru, you can donate to Animal Aid Unlimited.